Every now and then – in the UK at least – a movie appears in cinemas that doesn’t seem to belong there. It will have the look and feel of a movie that should have gone direct to video, and it will have a number of second- or third-tier stars heading up the cast. It will be a generic, virtually simplistic genre piece whether it’s a horror movie, an action movie, or a comedy. And it will not attract glowing reviews or prove to be a box office success. In short, it will be the movie you go and see when you get to the cinema and the movie you really want to see has either already started, or sold out. Welcome to the world of the B-movie, the A-movie’s little brother (or second cousin if you want to be a little more dismissive). 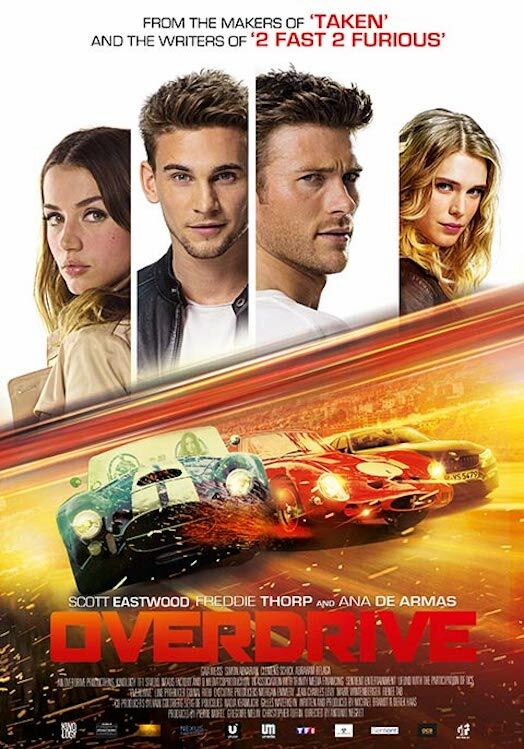 And on this occasion, welcome to the French Riviera, and a movie called Overdrive, a semi-glamorous action thriller with moments of humour that are often unintentional. 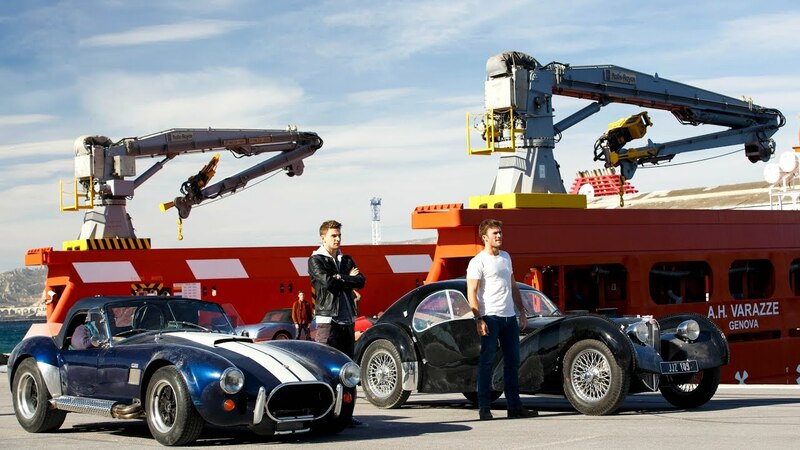 It’s a movie that borrows liberally and without embarrassment from a variety of other action movies, but in the main, viewers will spot references to the Transporter movies (which share this movie’s location), and The Fast and the Furious franchise. Is it as good as those other movies that it appropriates its DNA from? Well, that depends on the entry. Suffice it to say, it never looks in danger of overtaking even the worst of those movies (they know who they are), or giving audiences enough invention or “wow” moments to make it stand out from the crowd. A French/US co-production, the movie coasts along on a small wave of goodwill, and tells its simple tale in as convoluted a fashion as possible. One of the few things that is actually impressive about the movie? That it contains so many red herrings, false trails, and confusing twists and turns, and doesn’t trip itself up all of the time trying to keep them all up in the air. It involves two half-brothers, Andrew and Garrett Foster (Eastwood, Thorp), who have travelled to the South of France in an effort to steal expensive, one of a kind cars and sell them on to big money collectors. They steal one such car, a 1937 Bugatti, only to learn that it’s owned by criminal bigwig Jacomo Morier (Abkarian). Facing certain death, the brothers manage to persuade Morier to make it up to him by their stealing another car, a 1962 Ferrari 250 GTO, from a “business” rival of Morier’s called Otto Klemp (Schick). Morier gives them a week to get him the car, a timescale that requires them to hire a crew of like-minded car thieves. Andrew’s girlfriend, Stephanie (de Armas), invites herself along for the ride, and just to ensure that Garrett isn’t left out, enlists the aid of her friend, Devin (Weiss), as well. And so begins a less than complex game of bluff and double bluff that involves the step-brothers, their girlfriends, a group of anonymous drivers, two rival criminals and their gun-toting henchmen, a dozen or so classic cars, two Interpol agents on the Fosters’ trail, and Morier’s cousin, Laurent (Belaga), who may or may not be playing both sides (though it doesn’t really matter). It’s a standard heist movie, playing with misdirection as a recurring plot point, and making sure that everyone except Laurent looks well groomed and well dressed. In many ways, the look of the movie is its most important element, with Laurent Barès’ bright, sunshine-infused cinematography keeping things shiny and attractive, whether it’s the sheen glinting off the classic cars on display – they really are objects of mechanical beauty – or the sun-kissed hills and environs surrounding Marseille (where the movie takes place). Add a handful of car chases that zip and swing and gambol amid said surroundings and you have a pretty, if vacuous, movie that doesn’t have any huge ambitions, and just wants to be entertaining. And despite all the silly plot twists and exaggerated storyline and depth-free characters and inane dialogue and desperate humour and join-the-dots direction, Overdrive is an enjoyable way to spend ninety-some minutes, partly because it really doesn’t try hard at all, and partly because it’s actually quite charming in a way that’s both undemanding and innocuous. This is the perfect movie to watch on a Saturday night with beer and pizza (if you’re a man), or Prosecco and pizza (if you’re a woman). It doesn’t require the viewer to think too much, it wears its heart on its sleeve in terms of the slightly underwhelming car chases (which are too concerned with ensuring no damage comes to the cars, especially the classic ones), and the soppy romantic interludes it foists on the characters and the audience at regular intervals. You could view it as a guilty pleasure, except that it’s not quite that bad. It’s not great, but it’s not entirely bad either. As the step-brothers out of different mothers, Eastwood is the serious one looking to make a commitment to Stephanie and stop being a car thief, while Thorp is the happy-go-lucky thrill seeker who doesn’t need a plan (mostly). The pair have an easy-going chemistry that works well, which is more than can be said for their characters’ romantic entanglements. Eastwood and de Armas look like a couple who are still trying to work out if they like each other, while Thorp and Weiss behave like a couple who, weirdly, have never met. Abkarian and Schick are acceptable as rival villains, while Belaga is appropriately slimy as Laurent. Colombian-born Negret oversees things with the flair of someone who was included in a list of Latino Directors to Watch in 2007, and who has worked solidly in television ever since, while writers Michael Brandt and Derek Haas, who penned 2 Fast 2 Furious (2003), rehash old glories and invite viewers to play Spot the Homage nearly every eight-ten minutes. With the viewer distracted in such a way, it gives the movie a chance to make more of an impression than it has any right to. Rating: 5/10 – already it seems we’re getting throwbacks to movies made in the late Nineties/early Noughties, and Overdrive is a prime example of a genre crying out for new ideas and then settling for the same old same old; breezy and forgettable, the movie roars through a series of minor skirmishes before settling into a predictable rhythm that culminates in a scene of vehicular slaughter that deserves a medal.